However, Apple's sudden price drop isn't a sign of impending doom for the tech juggernaut – it's the result of analysts missing the bigger picture. In fact, Apple stock is set for a tremendous rally due to one critical factor Wall Street is missing. For years, Wall Street has used Apple's iPhone sales as the key metric to measure the company's profit potential. However, things are rapidly changing ten years after the iPhone's debut. While iPhone sales remain an important part of Apple's business model, they no longer play a critical role in defining the company's bottom line. That's because Apple is making a seismic shift into providing digital services to consumers. 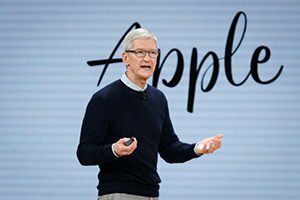 In house media content, digital applications and server management have become an increasingly large part of Apple's market orientation – and for good reason. As Money Morning Chief Investment Strategist Keith Fitz-Gerald points out, Apple's 1.3 billion active devices give the company unprecedented access to customers who are likely to purchase additional services from the company. Apple reported that it generated $18 billion in revenue from service sales in 2014. Just four years later, those figures have doubled to $37.19 billion for 2018. And this growth isn't likely to slow down anytime soon. FactSet reports that revenue from Apple's services division is expected to double again to $80.65 billion by 2022. And Morgan Stanley analyst Katy Huberty reports that this figure could reach $101 billion by 2023. Digital services are not only a fresh source of revenue for Apple, but they're also a catalyst for significant gross margins. The current average margins for Apple are around 38%, but the services division margins are upward of 50%. Huberty, a financial consulting firm, outlined how much the services division could add to the company's profits in the short term. In 2018, Apple stock provided shareholders with $11.91 per share. Huberty expects that services alone will add $2.23 per share to earnings over the next two years. When you combine this growth with other areas, it's estimated that Apple's annual earnings per share will hit $16.35 by 2020. The company's P/E ratio over the past several years has been close to 18.4, so this would translate to an AAPL stock price of $300 per share in just two years. Despite a rosy long-term projection, Fitz-Gerald believes that the short-term could still be bumpy for the tech giant. The markets remain volatile, and he believes that Apple stock could dip to $150 per share before recovering. If it does go this low, it would be an excellent entry point for any investor, and a perfect setup for 100% gains if Apple does hit $300. That would be a tremendous gain for Apple investors. But it's not the only profit play we're looking at. Well, here's the thing: This bit of "wisdom" is one of the biggest lies the professional investing crowd has foisted off on Main Street investors. Instead, there's a simple way for you to outsmart Wall Street at its own game – and capitalize on the ability to be nimble and fast-acting. If you follow this method, you could soon find yourself running circles around the mega-investment banks.